Why can’t we shoot deer after dark? Q: I have read that it is easier to stalk deer around the time of the new moon than it is when the moon is full. Is this true and, if so, why? A: Deer can see in very low light, but they do need at least some light, whether from artificial sources, such as the glow of street lamps, or from natural sources such as the moon. When the moon is bright, as it is around the full moon, deer are much more likely to feed in the open throughout the night, especially during the short days of winter and when they are under significant hunting pressure. At first light, they can be expected to retreat to cover, where they can lie up with full stomachs. Conversely, when the night is dark and there is no moon at all, they are more likely to feed during the hours of twilight when it is lawful to shoot them. That is why some stalkers try to concentrate their activities around the new moon period, when they can catch deer in the open during the first few minutes of legal shooting time, or sit and wait for them to come out of cover and show themselves in the evening before it is fully dark. Q: As a wildfowler I am allowed to shoot duck and geese under the moon and I can also shoot rabbits, wild boar and foxes at night. Is there some reason why we can’t shoot deer? So much countryside legislation appears to be written following advice from ‘experts’ who see the consultation process as an opportunity to force their own opinions and prejudices on the rest of us. The Deer Act is no exception. 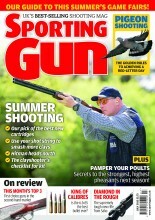 However, I am bound to say that in the case of the ban on night shooting I absolutely agree with the legislation. Deer are sensitive creatures and easily stressed. They regard the dark as a safe period when they can relax a little. I remember some research a few years ago which showed that stress levels increased enormously when deer were harried at night and I am sure that no true sportsman would wish to inflict that on his quarry. On the other hand, if they are only coming on to your land at night and are doing a lot of damage, shooting them at the scene of the crime may be the only option. That is the reason why licences are available but I very much hope that every application will be looked at with great care and licences for night shooting only issued when there really is no alternative. Reports from Scotland suggest that licences for night shooting are given out with the freedom of double glazing leaflets at the door of B&Q, but I very much hope that is not true. The licences are not supposed to be a prop for lazy buggers who can’t be bothered to put the effort in during daylight.